Use this vanity to bring more traditional style into your bathroom. This piece comes with a beautiful dark chocolate particle board base and a white artificial stone counter. Keep your bathroom clean with the vanity's roomy double-door cabinet. Bring a classic look and feel to your bathroom with this beautiful set from Magick Woods. Coverage for all vanity cabinets lasts from 3 years from the original date of purchase. Coverage for cultured marble vanity tops lasts from 1 year from the original date of purchase. For more information please call 1-855-995-5578. Enjoy the popular traditional look in your bathroom with this beautiful vanity. Its beautiful white marble counter and white solid wood base bring a great new look into your bathroom. The double-door cabinet has lots of room to put bathroom items. This simple vanity set from Avanity will fit right into any bathroom decor. This vanity has both an all-around look and a modern style. The single-door cabinet and drawers are great for putting away bathroom items. Make your bathroom look like new with this good-looking, useful set from Bosconi. Designed with a modern style and strong build, this vanity is a perfect choice for any bathroom. Its white acrylic counter and white fiberboard base will look beautiful in your home. Put a nice touch on your bathroom's look with this vanity set from Fresca. Essex 25-inch W 2-Door Freestanding Vanity in Dark chocolate With Artificial Stone Top in White Use this vanity to bring more traditional style into your bathroom. This piece comes with a beautiful dark chocolate particle board base and a white artificial stone counter. Keep your bathroom clean with the vanity's roomy double-door cabinet. Bring a classic look and feel to your bathroom with this beautiful set from Magick Woods. 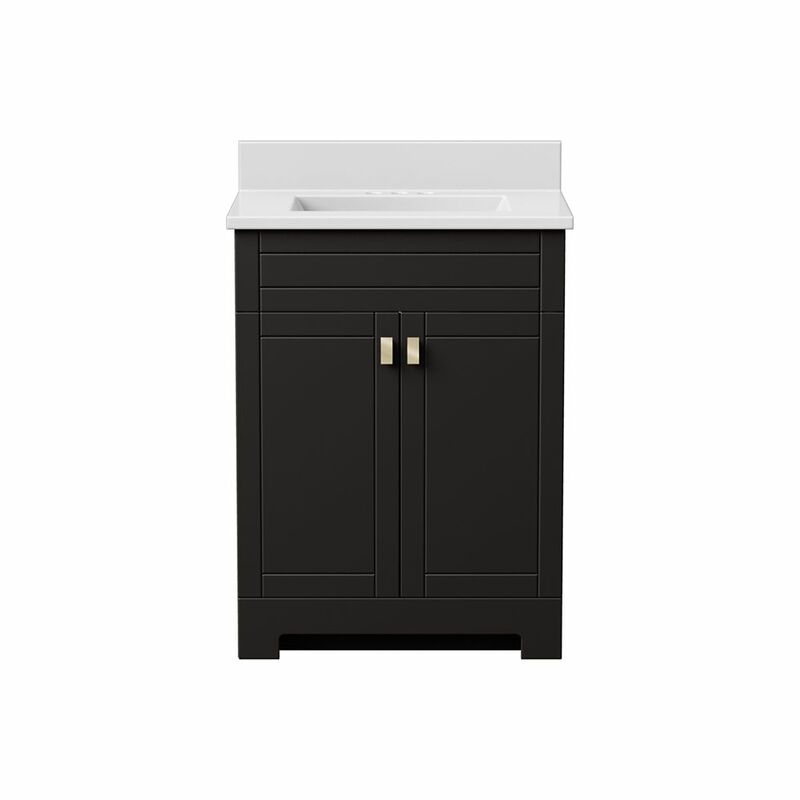 Essex 25-inch W 2-Door Freestanding Vanity in Dark chocolate With Artificial Stone Top in White is rated 4.3 out of 5 by 8. Rated 5 out of 5 by momsetak from Simple and elegant Love it! Easy to wipe and it looks great. Love the self closing doors. Rated 2 out of 5 by Karen1 from Counter doesn't fit base The top is slightly warped and doesn't have a way to attach to the cabinet. You'd think it would fit snugly into the cabinet and have a way to clip or screw in place. No instructions came with and only hardware is for handles. Not way to fasten it to the wall wither, so the only thing holding it all in place would be the plumbing. I'd like to ask for help, but the website won't allow me to sign in. All I can do is write this review and hope it gets poated and noticed by the company. Rated 5 out of 5 by SinghSaab from Looks great with rectangular sink Ordered online and it was delivered to my home on a skid. I find for this price it is excellent value. I didnt know how the vanity color would look like so to help others decide I have added photos of my install. What is the depth of the cabinet? Hi Jeff, the depth of the cabinet is 18 5/8 inch. I have the same problem. The top doesn't fit snugly: wobbles and slides around. Is it supposed to be this way? Are there instructions? Top doesn't fit snugly: wables and slides around. Help! See 2** review above for more info. Hi There, please let us know your contact number. Is the centerset where the taps go 4 inches? Hi There, Good Afternoon...!! Yes it is having a 4&quot; faucet center. Thanks, MagickWoods CS Team.